I had the opportunity, along with about 25 or so other blogging moms from around Indiana, to meet with Lt. Gov. Becky Skillman this week. It was mostly a Q and A session (which turned into a lively discussion about healthy food in school cafeterias), and it was really interesting to see the diverse viewpoints, blog focuses, and geographical regions represented by the group. 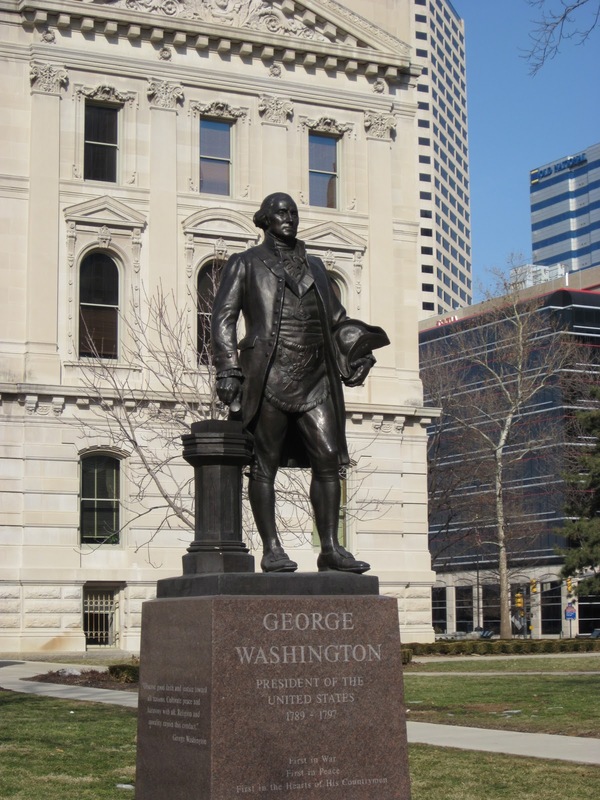 Since it's President's Day weekend, I thought we should say hello to two of our nation's finest, who you'll find gracing the grounds and halls of the Indiana Statehouse. I'm sort of a dork when it comes to beautiful government buildings... I love the sense of "important things happen here" you get when you step inside. (Washington, DC sends me into a frenzy!) 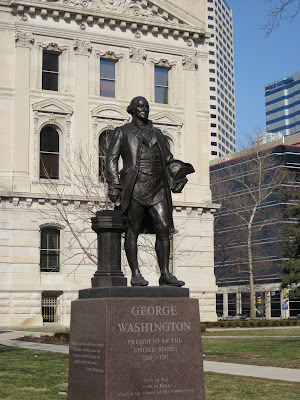 If you find yourself in Indianapolis, the Indiana Statehouse is definitely worth walking through. I've never taken the arrow, but I'm confident he'd love hearing the sound of his voice bouncing off the high ceilings and running wild on the marble floors. 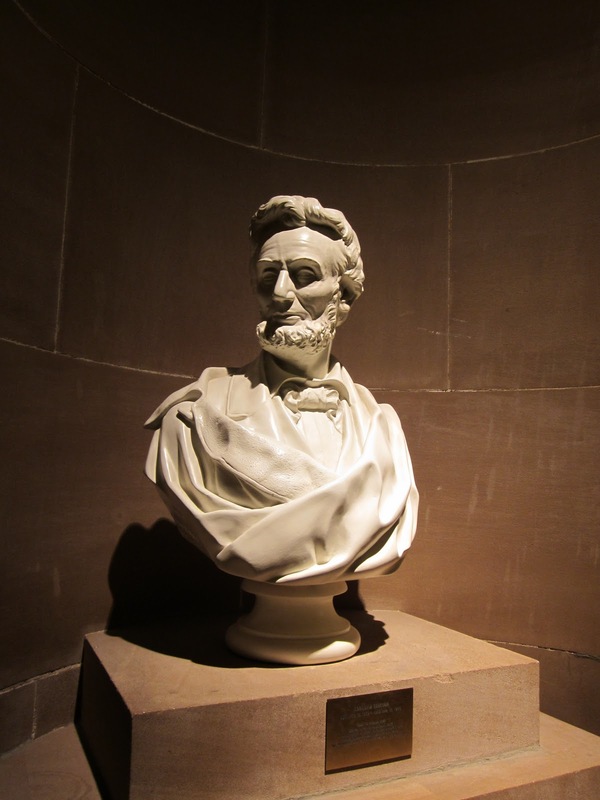 If you'd like to hear more about the time we had with the Lt. Governor, I enjoyed the posts that Angie at Just Like the Number and Amy at The 4th Frog wrote. Note: Security lines are much shorter if you enter through the back entrance on the west side of the building. Tours are offered. 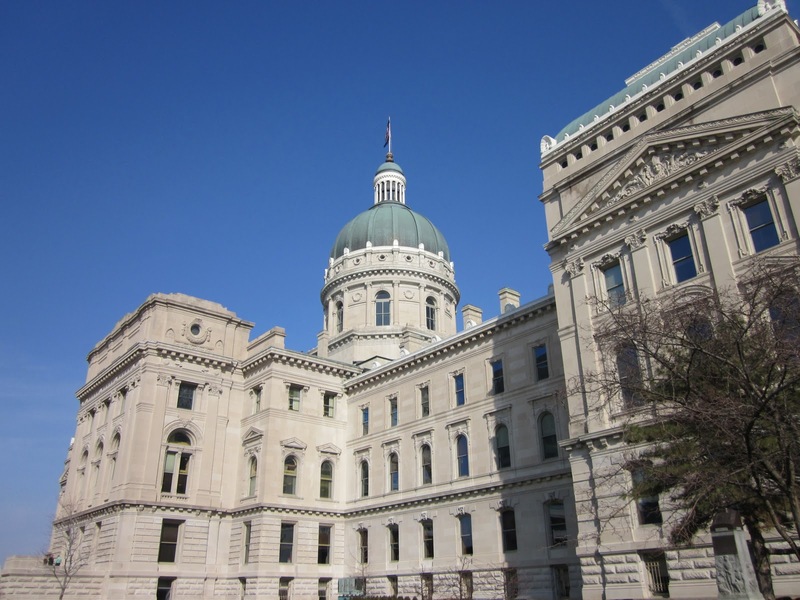 Contact the Indiana Statehouse Tour Office to make arrangements. I didn't realize you worked for Mayor Peterson. So did a woman in my office. Small world. So fun to see you again -- next time in April, right? I'd hoped to come to Columbus for the CVB event next week, but I have another commitment. 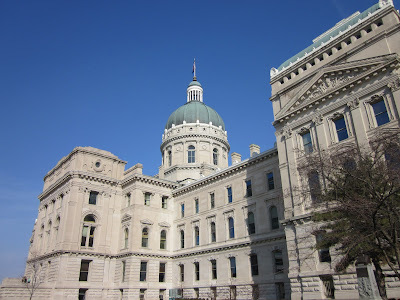 good to have the insider view of the statehouse, thanks. What a cool job that must have been! I'm always fascinated to hear what jobs moms had before they became SAHMS. Thanks for the mention. It was nice to see you again! Good post choice for President's weekend! Thanks for the insight! Be proud of your dorky love of beautiful government buildings - I think it's great! Sounds like a great experience and I love that the chat moved on to healthy food in schools! We are getting slightly better in Scotland but there's still a long way to go - it's easier to get a cheese toasty than a piece of fruit in the school where I work. I love seeing State Capitol buildings...I only wish I'd had more opportunity to tour the inside of some of them. One of my favorite visits to a state capitol building on the road was one to the capitol in Vermont. It was only a day or two after 9/11, but we were able to go in and wander the building at will. I wanted to thank you for coming to the Statehouse. This is the first time I’ve done a roundtable like this, but I’m glad I did. If ever I needed a group of advisers, I certainly have a group of knowledgeable, clever and creative women to call upon. Nicole - thanks for encouraging others to visit the Indiana Statehouse. Please feel free to stop by the office to say hi when you are in town.